Buy Now! Relieve your menopause symptoms like HOT FLASHES and loss of libido, and your PMS symptoms like cramps and bloating. 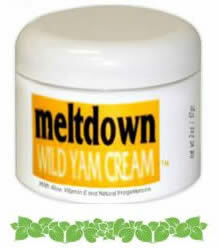 Q: What is progesterone wild yam cream? "Get me a jar of Yam Cream sent Special Express, I DON'T CARE about the expense, We are not going on vacation unless she has it. We want to have some fun on this trip!" Buy Now! Relieve your menopause symptoms like HOT FLASHES and loss of libido, and your PMS symptoms, like cramps and bloating.